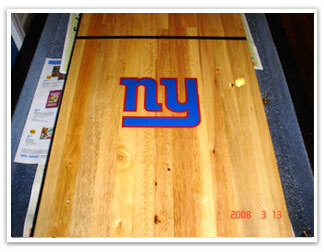 Here are some pictures of John Nacarlo's refinishing project. 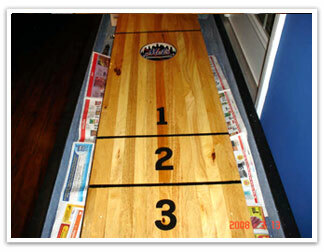 I have a 12 foot shuffle board table that had the pyramid scoring system. I have always hated playing because it did not have the lines going across. I was going to strip down the existing finish, but instead just flipped the board over and used the unfinished side. I filled the screw holes with wood putty and sanded the board with 150 and 220 grit sandpaper. I used vinyl numbers from Lowes and drew my own lines and filled them in with a sharpie which was compatible with oil and water based solutions. Since I was doing this I decided to put some team logos on it. How do you do that John? I printed them out on a piece of high gloss photo paper (that's why I needed 5 coats), cut them out and used spray adhesive to apply them to the table. If I could have done it over I probably would have used just used a regular logo sticker, which you could probably purchase at any sport store, or print them on a clear label sheet, which will have the adhesive already on it (they make it very thin). Let's just say I rushed my decision making. 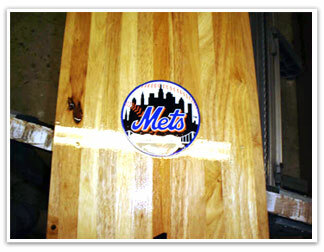 Before I put them on the table I did do a test run on a piece of plywood to make sure the logo's would not be effected. The only thing, which I knew in advance, was the white in the Mets logo has a little yellowish tint. Small price to pay for a cool table. I applied 5 coats of Minwax High Build Polyurethane sanding in between coats. The board looks awesome. Just thought this might give people an idea who want a different scoring system.